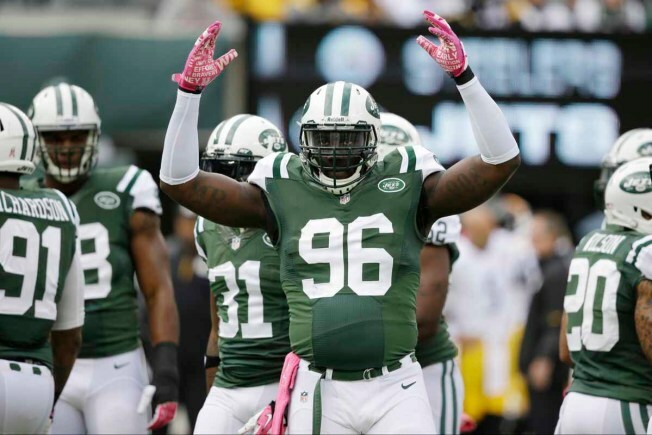 Muhammad Wilkerson has played a big role in team's success. Quarterback, C: Just once, it would be nice to see Geno Smith put together a few good games in a row. No one expects him to be John Elway, but some progress on a weekly basis shouldn't be too much to ask. It's encouraging that Smith has cut down on his turnovers since the first few weeks, but he still fluctuates far too often between looking terrific and terrible. Being a rookie, Smith gets cut a lot of slack. But how he performs down the stretch could say a lot about his future with the team. Running Backs, B+: The Jets are 4-1 in games when they rush for over 100 yards. Bilal Powell and Chris Ivory are volume runners who aren't going to dazzle you with game-breaking speed or fancy footwork. The team just seems to play better though when the ball is in their hands and they are controlling the pace of the game. The more touches Powell and Ivory get, the less Smith needs to do to help the team win. Wide Receivers, C: The wide receivers haven't helped Smith out too much. Santonio Holmes has missed five games this season but only had one big day to speak of when he was in the lineup. Stephen Hill doesn't assert himself enough when he's on the field and has only progressed in baby steps in his second season. Jeremy Kerley has stepped up to become the team's leading receiver but he could miss some time after injuring his elbow this past Sunday. Not to speak ill of the injured, but midseason pickup David Nelson has been a big upgrade over Clyde Gates. Tight Ends, B: Kellen Winslow's four-game suspension drags this grade down a bit but Jeff Cumberland has played well in his absence. Now that Winslow is finished serving his time, seeing the duo together in two-tight end sets could add a dynamic that the offense has been missing. Winslow is in the odd position of actually being helped by the suspension going forward as he has now had considerable time to rest his surgically repaired knee and could look refreshed upon his return. Offensive Line, B: The offensive line struggled a bit at the start of the season but they've come on nicely. The line deserves credit for their work in the running game as that's an area where they've excelled. Some of the sacks allowed have been a result of Smith holding on to the ball too long but there is still work to be done in pass blocking. The removal of guard Vladimir Ducasse in favor of rookie Brian Winters has been addition by subtraction. Defensive Line, A+: Collectively, they've been fantastic. The Jets haven't had a player record double-digit sacks in a season since John Abraham did so in 2005, but Muhammad Wilkerson appears to be on his way with eight. Sheldon Richardson is a legitimate Rookie of the Year candidate while fan favorite Damon Harrison eats up a ton of space up front. At 3.1 yards allowed per game, no team in the league has been better at stopping the run than Gang Green. Linebackers, A: An underappreciated group, they've been a big help in both the passing and running games. David Harris has bounced back nicely after a disappointing season a year ago and veteran Calvin Pace appears to be rejuvenated at age 33. Demario Davis has infused youth into the position and has all the makings of being a very good player in the years to come. Quinton Coples has been quiet most of the season but the hope is he can continue to contribute after a big game against the New Orleans Saints. Cornerbacks, F: By far, the weak link of the defense as well as the team. Rookie Dee Milliner has now been benched twice due to poor play but he is coming off arguably his best game as a pro. Antonio Cromartie has been a downright liability at times and his struggles to keep up with fast receivers has led to one too many big plays. Darrin Walls has been decent off the bench but not good enough to seize a starting job. In his fourth season, Kyle Wilson hasn't really taken any steps forward to become a better defender. Safeties, B: Production from the safety position hasn't been overwhelming by any means but they get the job done. With the cornerbacks getting beat in coverage so often, they do good enough work to make tackles and prevent the opposition from scoring. Perhaps no fault of their own, their grade is hurt a bit because the corners tend to leave them exposed. Kickers, A+: Nick Folk has been so good, it wouldn't be right to factor in punter Ryan Quigley's struggles when grading the unit. Folk has been perfect on all 23 field goal attempts this season and has accounted for 83 of the team's 169 points scored. For an offense that doesn't exactly light up the scoreboard, Folk has been an automatic three points whenever the team is within striking distance. Kick & Punt Returns, B+: The addition of Josh Cribbs added an air of excitement that had previously been missing. The return game was a nonentity before his arrival but is now a must-see event whenever Cribbs is on the field. He's still shaking off the rust after going unsigned for the first six games but appears to just be warming up. Over the final seven games, he could do wonders for the team's starting field position. Coaching, B: The Jets commit a league-worst 8.4 penalties per game. Discipline starts at the top and, when combined with their poor turnover differential, they are simply making far too many mistakes for the coaches to go without blame. The offensive play calling can be far too reliant on a rookie quarterback at times and the team tries too hard to be the passing team that they aren't. Having said that, the team plays terrific defense and the coaching staff has them performing at a high level considering some of their deficiencies. Head coach Rex Ryan, who was believed to be a goner prior to the season, appears to have earned himself some job security thanks to his overachieving squad. Overall, B+: Preseason predictions often aren't worth the paper they are printed on. If the Jets want to be known as a team that was picked by many to finish dead last yet went on to have a decent year, mission accomplished. Winning five of their first nine games certainly makes for a great story, but it will be what the Jets do over the final seven games that will tell the tale of the season. How Smith performs from here on out and whether or not the corners will be able to improve will play a large role in how the final chapters are written.